Melanie is also looking for this same cat. I’m looking for a baby GUND No. 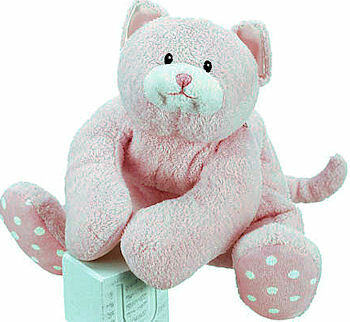 58239 13 inch pink velour chenille kitty cat DOTTIE DOTS with a white muzzle and pink satin ears. It’s ALL SOFT- it’s NOT a rattle. My daughter has lost her kitty and she is crushed. She is 7 and has had “Kitty” since she was born. I have not been successful finding the 13 inch Pink Gund Dottie Dots (no rattle) anywhere. Anything you could do to help would be greatly appreciated. The two are very similar just different sizes. Not sure if either is the one you need? Found! See listing in Melanie’s comments.